Michael Levitt, CEO of The Michaels Organization, poses for a photograph in his home office on the Delaware River waterfront in Philadelphia, Friday, Oct. 27, 2017. 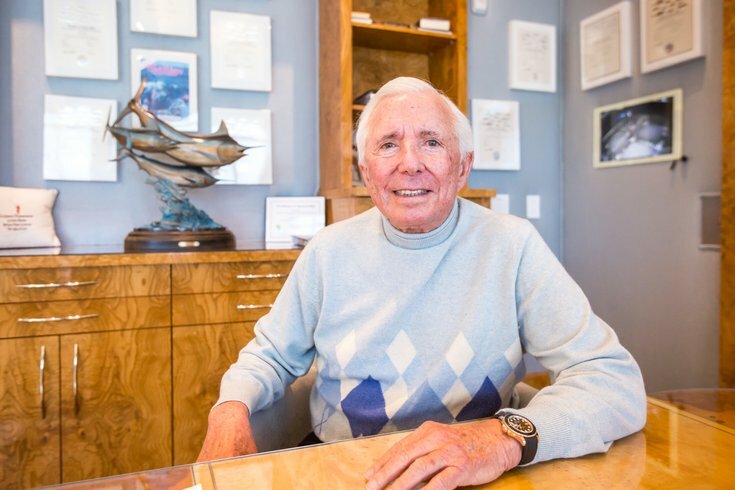 The walls of Levitt's home office are lined with certificates of world records he has held in sport fishing. When he was just 10 years old, Michael Levitt remembers renting a small rowboat and heading into the bay in Atlantic City to catch fish. “I had to know the tide schedules,” he says during a phone call from his home on the Chesapeake Bay. Levitt, inducted into the International Game Fishing Hall of Fame last weekend, has a lot to say about being a sportsman. But as the founder and CEO of The Michaels Organization in Marlton, he's also a vocal advocate for animal welfare and affordable housing. In fact, he's a member of the Affordable Housing Hall of Fame. “Providing people homes is a terrific way to make a living,” says Levitt, whose company (he started it in 1973) has built affordable homes in 350 communities for more than 100,000 tenants spanning from Hawaii to the U.S. Virgin Islands and everywhere in between (34 states in all). What seems to drive Levitt, even as he takes a more advisory role in his company these days, is finding new ways to make affordable housing available in major metropolitan areas. “We house over 100,000 people,” says Levitt, who is currently building new company headquarters on the Camden waterfront as part of a development project dubbed "Camden Rising." “We have a great influence in a lot of different cities,” he said. Today, the company is one of the most active and successful affordable housing developers in the country. Levitt, who was working on his first million-dollar real estate deal before he turned 30, is sending a message about how long-struggling cities like Camden can succeed with an emphasis on affordable development rather than gentrification. Levitt’s vision of affordable housing has always meant that low-income people with access to government subsidies should be able to live in clean, safe neighborhoods – both in the Philadelphia area and nationally. The long-term plan promises that access to more affordable housing will kick-start a better quality of life overall. It’s a tall order. And one that’s not exempt from a lot of socio-economic questions about poverty, culture and race. In Camden, and other inner cities around the country, projects built in the 1960s and '70s are being leveled to recreate real neighborhoods. For community advocates, this means ensuring that low-income residents have access to better places to live. For business and political leaders, there can sometimes be a selfish push toward gentrification and economic development that risk alienating longtime residents. It’s been a delicate dance in Camden during the last few years to ensure that both interests are served without alienating important communities. The debate, however complex, hasn’t stopped Levitt from remaining on the forefront of what is now understood to be the affordable housing movement. When he got started, it wasn’t always fashionable to be talking about affordable housing when others were touting luxury homes. “We think it’s making an amazing difference,” says Levitt, who is yet again playing a role in Camden’s newest revival story. 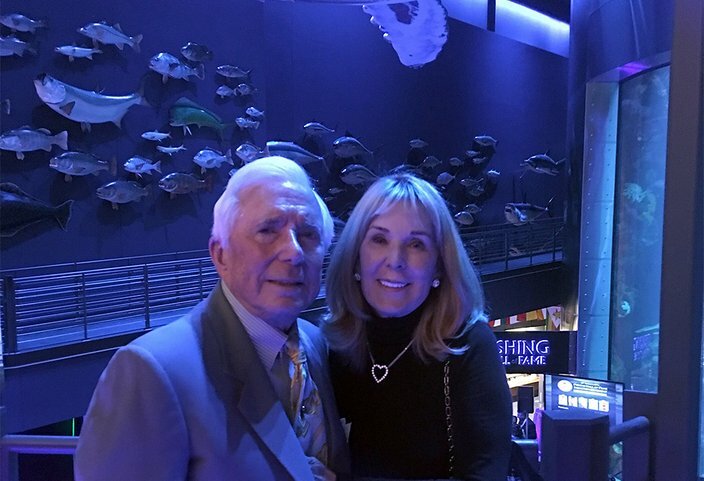 Michael Levitt and his wife, Patricia, pose for a photo inside the World of Wildlife National Museum and Aquarium in Springfield, Missouri. Levitt was inducted into the International Game Fish Association's Hall of Fame last weekend. For Levitt, a huge selling point of the modern affordable housing movement is focused on tenants by way of his company’s charitable arm, The Michaels Organization Educational Foundation, which has been giving millions of dollars in college scholarships to residents living in affordable housing since 1991. Michael Levitt stands next to the 296-pound Striped Marlin he caught on 12-pound line on May 17, 1998 at Three Kings, New Zealand. Levitt likes to talk about the thank-you notes he receives from college graduates who have benefited from the scholarship program. They mean a lot to him. He also admits that his lifetime interest in sports, first as a high school quarterback and later as a world-class angler, has provided solid life lessons. “You have to go after it and keep it up and not give up,” he says. It’s the same philosophy he applies to philanthropy. After all, to catch world-record fish like Ernest Hemingway (another angling Hall of Famer), Levitt admits he’s had to have a heck of lot of patience. Growing up in Ventnor – Levitt did not come from money. He didn’t think he would be taking a private helicopter back and forth between his Front Street condo in Philly to his Chesapeake Bay home, that is, when he’s not flying into New York City to visit his grandkids. “I’m not big on driving,” he says. He also didn’t expect to become an animal welfare advocate in his golden years. But that happened rather accidentally while he was in St. Croix. Levitt and his family were vacationing on the island when they decided to donate old towels and blankets to a local animal shelter. That’s when they met Dolly, a small yellow lab mix that would become their beloved pet for the next 12 years. Dolly, it turned out, would guide the Levitt family onto their next adventure, this time in animal welfare. “We found out about this program where they ship dogs for adoption from St. Croix to four or five cities in the U.S., including Philadelphia,” says Levitt. By the time he was flying back to Philly with Dolly at his feet, he had decided to find out more about no-kill shelters. He’s since donated upwards of $2.5 million to Best Friends, a no-kill sanctuary in New York City. The money is used to help people in need to pay for medical care for their pets. 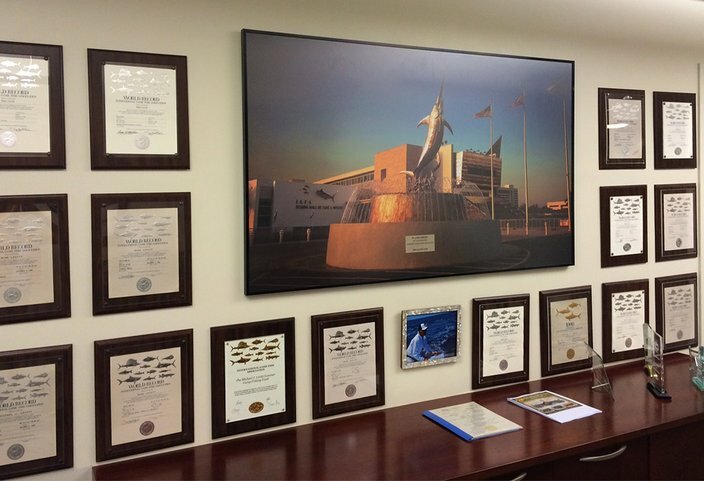 Michael Levitt's office features certificates from his world-record fishing accomplishments and a photo of the World of Wildlife National Museum and Aquarium in Springfield, Missouri, which houses the International Game Fishing Association Hall of Fame. As Levitt gets ready to fish in Guatemala this year – he took nearly 50 friends and chartered 12 boats on the last trip – he says he intends to keep nurturing a company culture that is built on innovation, financial stewardship and responsible ownership, ultimately giving back to the communities where he builds. For Levitt, who also has built 16,000 housing units for the military and more than 10,000 student housing facilities, seeing what’s next for Camden is a big deal. The city is welcoming three new development projects valued at more than $350 million, including a proposed Hilton Hotel and the new headquarters for American Water Works. In its heyday, Camden laid claim to RCA Victor which produced records that were shipped all over the world. There’s also the legacy of the Campbell’s Soup plant that provided jobs to people throughout the region. It’s taken decades to begin to heal from drug scourges and abject poverty that followed. But there are glimmers of progress today thanks to some hefty tax incentives and progressive development proposals. Seeing what could be a rebirth of the longtime suffering city after many years of what some might call empty promises – like modernizing the failing sewer system a decade ago – makes Levitt hopeful. It feels like the city’s caught up with his longtime vision of affordable housing, education and job training. “It’s really wonderful,” says Levitt, especially since last year the state Department of Housing and Urban Development gave Camden a $13.2 million grant to revitalize the Clement T. Branch Village public housing site in Centerville. It’s one of the last public housing sites of its kind to be redeveloped by Levitt’s company with a unique new residence designed for seniors and people with disabilities.